and get your audience reach out to you with SEO-optimized LinkedIn Profile. 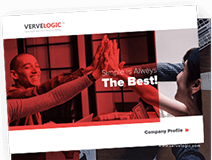 What Makes Verve Logic Different? We build high-touch executive LinkedIn profile creation service. We value our relationship with you and use our digital marketing experience to position you on LinkedIn in a powerful way. These guys have worked incredibly well in every section of my LinkedIn profile. Highly satisfied! They have created a well managed LinkedIn account for me. Thank You. Managing LinkedIn was a difficult task for me. I sought their help and now I can see some real amazing results. I would love to come back to you guys again. Experienced and intelligent team of people who have solved several problems in my profile. You are the best!